The Waratahs must improve their attitude and lift mentally and technically for the key Super Rugby battle against the Brumbies at ANZ Stadium on Sunday, Stephen Hoiles says. New South Wales, the defending Super Rugby champions, are 10 points behind the Australian conference-leading Brumbies having played one game less than the Canberra-based franchise. The Tahs have a 2-2 record, but they have conceded a four-try bonus point in three of their four games having excelled defensively last season. Hoiles, a former Brumbies captain, said the defensive issues this season were more a case of individual lapses rather than anything structural. 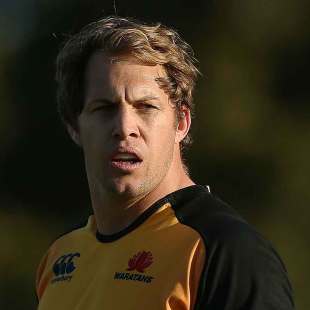 "It's kind of a good summary of where we are at, at the moment, because a lot of defence is about attitude and we're probably just off a little bit there," Hoiles said, suggesting the Waratahs were not reacting quickly enough when they turned over possession. "Technically we can improve and probably mentally we can certainly add a little bit more focus to our game, so that's what we are looking at this week." Hoiles said the Brumbies would be "pretty confident" heading into the fixture in Sydney, and that would "make it harder" for the Waratahs, "but we probably need something like that at the moment". "We need a big challenge," Hoiles said. "We let ourselves down last weekend and we've been a little bit patchy so far, so it's certainly our biggest challenge." Hoiles said the Tahs weren't obsessed with ladder position, even though defeat on Sunday could see them trailing the Brumbies by as many as 15 points on the table. "We don't really look too far ahead or look at the ladder at this stage of the season," Hoiles said. "Not even necessarily from a points point of view. "But just from a performance point of view, we need to start putting some really good form together. We do it for 20, 40, 60 minutes but we need to be able to do it for 80 minutes. And against the Brumbies, I think this will be our best test."